I am using this library together with react-native-firebase. Installation for iOS with pods went fine, it was a disaster on Android. I followed the official installation instruction for both automatic linking and manual linking and both failed with this error. I tried to mitigate this error with the command below (similar issue on Flutter), but it just gets worse. I've reviewed all related files and do not see any that specifies 26.1.0. Here's my configs if they help. @jgfidelis As soon as I rebuild, it gives another error (AAPT2) and a few other errors. Caused by: org.gradle.tooling.BuildException: Failed to process resources, see aapt output above for details. @sibelius I have disabled it, but another error pops up. Perhaps it has to do with the sdk version I'm on? I am not sure which sdk version should I use (coming from iOS), here's the configuration. warning: the transform cache was reset. /~/.gradle/caches/transforms-1/files-1.1/appcompat-v7-23.0.1.aar/63be421add3cb80ad7738b9c93904cf8/res/values/values.xml:113:5-69: AAPT: error: resource android:attr/fontVariationSettings not found. /~/.gradle/caches/transforms-1/files-1.1/appcompat-v7-23.0.1.aar/63be421add3cb80ad7738b9c93904cf8/res/values/values.xml:113:5-69: AAPT: error: resource android:attr/ttcIndex not found. /~/rn055/RN055/android/app/build/intermediates/incremental/mergeReleaseResources/merged.dir/values/values.xml:187: error: resource android:attr/fontVariationSettings not found. /~/rn055/RN055/android/app/build/intermediates/incremental/mergeReleaseResources/merged.dir/values/values.xml:187: error: resource android:attr/ttcIndex not found. @code-by Glad to know I am not alone. @sibelius The example you provided earlier was not helpful. I have tried linking manually before opening this issue. Please reopen this issue. I will reopen to see if anyone helps you but this is not a RNCamera issue, but an issue on your project. We use RNCamera and Firebase on our projects. @sibelius i follow you suggest and can view camera, but scan barcode not work at all. I check many issue about barcode, but no luck? I think my issue is i update Android studio to new version. @brickolicious do you test barcode scan? Does it work? Execution failed for task ':react-native-camera:compileDebugJavaWithJavac'. Thanks to @jgfidelis . I just change as below and it work. A mix of things worked for me. I added these changes and can get the build to compile. But when launching the debugger, the app crashes on right as it starts up. Is there possibly an SDK mismatch or something? I was using Firebase and React Native Camera. Then the app is crashing. After several hours of investigation, I found out that React Native Component <Switch> is the culprit. 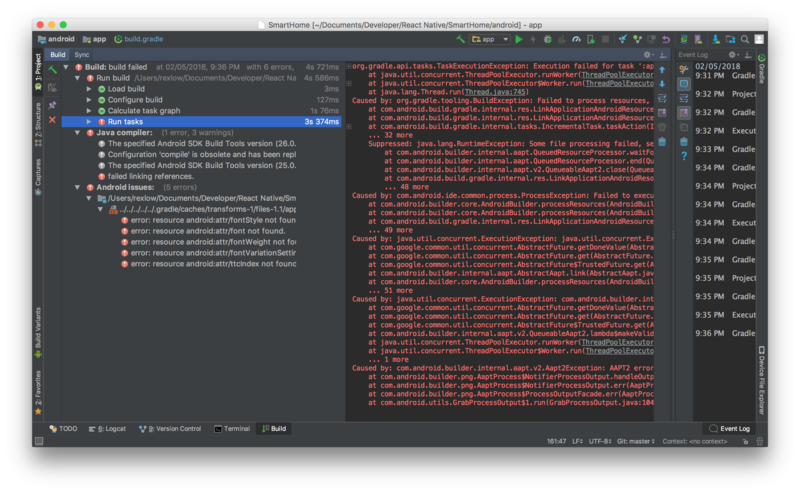 Then I had to downgrade to com.android.support:support-v4:26.0.1 in app/build.gradle as @AndreiCalazans suggested. So, if anyone of you is facing the same problem, maybe this will help. All the best in coding!